Want to make your debutante worth remembering? We can help you make eyes turn towards you when you arrive at the ball. 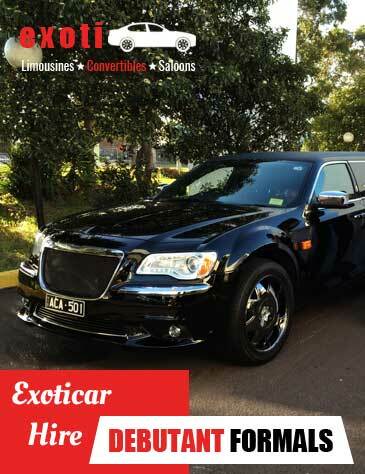 Exoticars debutante limousine services in Melbourne serve to be an affordable solution. We have a wide range of stretch limos and luxury town cars. When you want to enjoy the feeling of being a prince or princess on your special night, we are here to help. Book your next comfortable and luxurious ride with us. WHY WE ARE A PREFERRED CHOICE FOR DEBUTANTE CAR HIRE? Gone are the days when debutante balls used to be a casual occasion. In those times guests were dropped off by their parents at the party. With the passage of time the trend seems to be changed a lot. These events are so much formal now. To mark their presence the guests are willing to do everything special. It is here when Exoticars comes into play. Being a part of the Australian high school system this day is really important to all the females and males. Who don’t want to celebrate graduating from high school in a luxuriant style? We can help you step into the adult world in a limousine of your choice. Our debutante limousine services in Melbourne give you an opportunity to hire luxury town cars at the most reasonable prices. So we are here to make your time with formals, dances, and parties, more special. Now we can manage group bookings for limousine. Call us. HOW CAN EXOTICARS HELP YOU MAKE A PERFECT DEBUTANTE ENTRY? Arriving in the perfect tuxedo or dress is something anyone can do. For your unique debutante entry we have an exclusive idea. If you want to attract onlookers and stand apart the youngsters, Exoticars help you make a stylish arrival. Utmost luxury and privacy you deserve. A sense of relaxation and class to spice up the night. For your classy appearance at the debutante balls, no one serves your need better than us. We are an exclusive limousine hire company in Melbourne. Having professional experience of years in providing limousine services we cover the entire region. You can avail services from all metropolitan and regional areas. Whether you are arriving at the ball as a small bunch, a couple, or a big group, our fleet of luxury vehicles suits your every need.